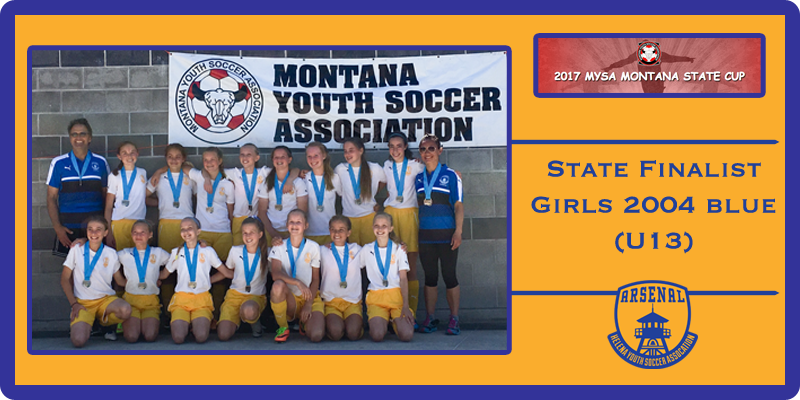 2004 U13 Arsenal Girls Blue team coached by Michele Zentz and Joseph Vranka, took second place at the Montana State Cup Tournament in Billings, Montana this last weekend in the 2004 girls bracket. The girls played an exceptional tournament with tight defense, incredible goalkeeping, and a counterattacking offense that came up big at the right times. The road to the finals was an exciting one with a 3-2 win against the Bozeman Blitzz, a 2-1 victory over the Missoula Strikers and a 1-0 victory over Great Falls’ Rush. The girls then played Great Falls in Sunday’s semi-final putting up another 1-0 win after a hard fought game. The real suspense came during Monday’s championship game when the girls played Bozeman Blitzz to a 0-0 draw. There were scoring chances on both sides, with Helena sending two shots off the cross bar of the goal. The game was ultimately decided by penalty kicks with Bozeman coming out one shot ahead of Helena. Goals were scored during the tournament by Lilli Danzer, Jaelyn Dwyer, Linnea Onushco, Hannah Martin, Odessa Zentz. Assists were provided by Lilli Danzer, McCoy Vranka, Emma Wilson and Hannah Martin. Odessa Zentz, Payton Mongoven and Emma Wilson put in stellar performances as goalkeepers with numerous saves. Penalty kicks were scored in the shootout by Brogan Vranka and McCoy Vranka. The team effort was completed with hard work and hard play by Catherine Burbidge, Emma Compton, Maddie Hermes, Camryn Mosness, Elsa Grebenc and Riley Schoenfeld for an awesome weekend of soccer!